Help us take big steps for Equality Network and support the Scottish Trans Alliance Equal Recognition Campaign in 2017! We are thrilled to announce that we will be taking part in the 2017 Edinburgh Kiltwalk to raise vital funds for our charity, Equality Network, and help support our Scottish Trans Alliance Equal Recognition Campaign. Some of our staff and Board have already signed up for the Wee Wander and we will have staff at the end to welcome you home. 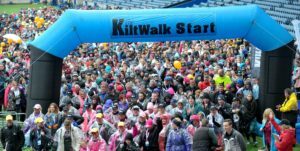 Thanks to Sir Tom Hunter and the Hunter Foundation who underwrite the Kiltwalk, the fundraising potential for our charity is bigger than ever before with 100% of all the funds you raise coming to us (all funds should be sent to the Kiltwalk first and then will be sent onto us by the Kiltwalk team). Fees are payable on registration, but if you raise, in sponsorship, at least £10 more than the registration fee then this fee can be claimed back from us on request. For example, if you decide to tackle the Mighty Stride, you would need to raise over £41.65 to be able to claim back the registration fee. All you need to do is to choose the walk you want to do and select Equality Network from the drop down charity list. Registration is quick and easy! Unfortunately there is currently only the option to register as male or female. We have raised the issue of non binary inclusion with the organisers and they are looking into it. Please let us know if you have any difficulties with registration. Once you have registered, start encouraging your friends to sponsor you and send us any stories and/or photos which we can share on our social media! When you do sign up, please send an email to (lynne@equality-network.org) as the system does not automatically tell us you have registered. Everyone who raises more than £10 will receive a new Equality Network or Scottish Trans Alliance tshirt and anyone raising more than £100 will become a member of our exclusive Friends scheme. On behalf of Equality Network and Scottish Trans Alliance we would like to thank you for your ongoing support and hope to see you on 17th September!